This week's tech. reveals everything you need to know about Facebook Home, the app that's all set to take over millions of phones. Inside the latest issue of tech. 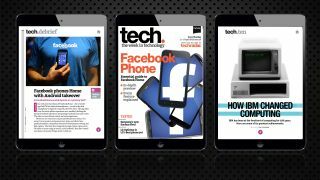 - TechRadar's glorious iPad-only magazine – is an in-depth preview of the first phone with Home, the HTC First, an explainer on Mark Zuckerberg's latest service and all the reaction from the launch. Also, we have the latest news on Sony's budget-friendly 4K televisions and an investigation into Google's massive app store clean-up. What's app got to do with it? tech. also sees how WhatsApp – the instant messaging service that Google flirted with buying – contends against Apple iMessage. The digimag also charts the amazing things IBM has brought to the computing world, plus all the latest app, movies and books you need to buy now. Oh, and there's also a tribute to the brilliance of Lucasarts, the games studio Disney has decided to shutter. And if that wasn't enough, there's in-depth interactive reviews of Samsung's Surface rival and LG's best phone ever – the LG Optimus G.
Download tech. magazine today from Apple Newsstand and get the first five issues absolutely free.